The stem is erect and bears the flowers. The flowers are blue-violet or lilac, large, and attractive. They have six petals and one bears a yellow spot. The leaves are green to dark-green, round to oval, and glossy with leathery blades. The leafstalks (petioles) are thick and spongy and contain some amounts of air that enable the plant to float. Masses of fine branching roots hang underneath the floating plant. The plant is propagated by seeds and vegetative offshoots. The weed forms a dense mat that interferes with the flow of water in irrigation canals and serves as a breeding ground for mosquitoes. It competes with rice for soil nutrients reducing the yield when left uncontrolled. 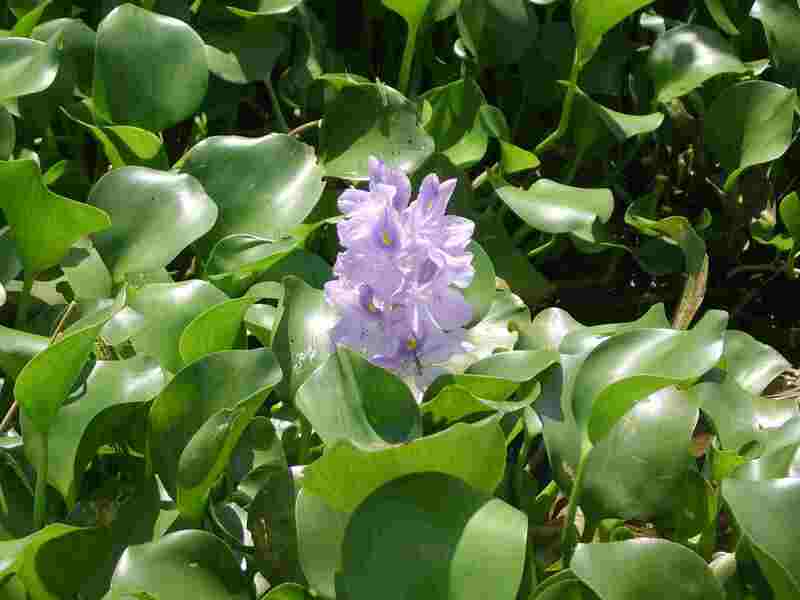 Water hyacinth is the most damaging aquatic plant worldwide. Biological control with the use of weevils, Neochitina eichhorniae and N. bruchi. Ask for assistance from your local agricultural office for more information on this control measure. Grodowitz, M. (1998): An active approach to the use of insect biological control for the management of non-native aquatic plants. Journal of Aquatic Plant Management. Vol. 36: pp. 57-61.